We write for people whose kids get sent to war. Our readers need to know. With what is going on in American politics right now it seems apt that I am reviewing a film about the press in the aftermath of the 9/11 attacks and the eventual Iraq invasion. A free press is essential to any democracy. My right to report or read the news is as valid as yours and, despite our opposing view on politics, is at its very core how debate should begin, and betterment should be attained. 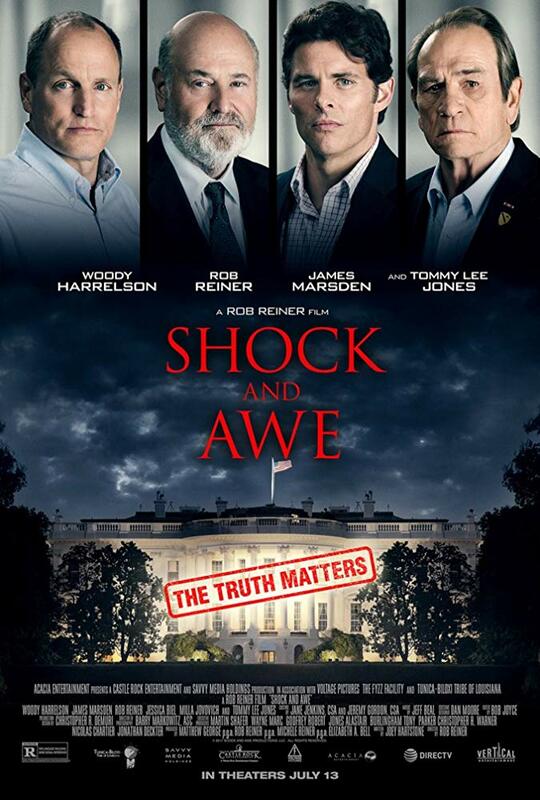 What Joey Hartstone has achieved within his screenplay for Shock and Awe is a fine balance between telling a political story, telling real life events as they unfolded, and proving once again that journalism – good journalism - needs to be at the forefront of everything. Directed by and starring Rob Reiner as John Walcott, the boss of media news group Knight Ridder, the film follows Walcott and his team as they begin to have doubts about Iraq’s part in the 9/11 attacks and the Bush administration push to invade Iraq as retaliation and because of supposed weapons of mass destruction. Walcott, along with Jonathan Landy (Woody Harrelson), Warren Strobel (James Marsden), and Joe Galloway (Tommy Lee Jones), report that Iraq has no such weapons, that Bin Laden in Afghanistan was responsible for 9/11 and that Bush, Cheney, Rumsfeld and the rest of the administration are lying to the American people, that the invasion is illegal, unwarranted, and dangerous to the lives of U.S troops. They are, of course, eventually proved right. What Shock and Awe does is it unashamedly tells the story from the one side, that of Knight Ridder. It goes for absolutely no political balance and, with hindsight on its side, it doesn’t need to. Knight Ridder published fact, source proven facts that we see today are undeniable. Whatever your opinion on the Iraq Invasion, or on the Bush Administration, you know now that lies were told, that good intelligence was ignored basically because America wanted a regime change in the Middle East. You can argue your interpretations of who said what and who did what all you want, it has been proved that no such weapons existed, that the reasons given for the invasion were falsified and that all the major media outlets followed their paymasters at the White House in their support of false testimony. Knight Ridder were the exception and, from the film, I was given a timely reminder of what great journalism looks like. These guys weren’t first to the story, they didn’t chase clicks or reader numbers. They investigated, they interviewed sources, then more sources making sure that they had all the information right before committing pen to paper. They were the only news outlet reporting that something was wrong, they stood up to a very partisan and rabid population that were rightly shocked and angered by the 9/11 atrocities, and they published good journalism. They also didn’t have to apologise to the American people like every other news outlet a couple of years later. It was refreshing to see a team of journalists that chased sources, that backed up one source's story with a second, and then a third source. It was refreshing to see journalists say ‘hold on, we don’t quite have this right yet’ rather than rushing to print. It was refreshing to see that, within the world’s media, these guardians of the truth still exist. In a world where the President can ban from his briefing room a journalist for the crime of asking a question, it is essential that journalists get back to doing what they used to be great at and that’s protecting the electorate from the lies and brutal corruption at the heart of government. Stop with trying to be first, try being right. 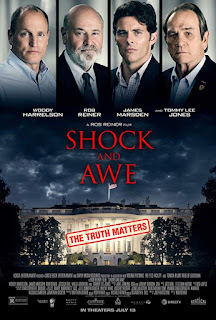 Shock and Awe is a great film that is nicely directed, well cast, and had a good pace but it's more than just a film, it’s a reminder to the world what we are going to lose if we don’t defend our journalists, if we don’t question our leaders, and if we blindly fall down the rabbit hole of corruption and click baiters.